Some health visionaries are saying that Biofeedback therapy and Neurotherapy are the whole future of healthcare. This new field is called Quantum Biofeedback, and it is done with a biofeedback device that is designed to perform quantum biofeedback easily and accurately. This biofeedback device is called the LIFE System. Imagine being able to boost someone’s immune system… seeing what vitamins and minerals their body is asking for…and giving them the vitamins and hormones they need. This is now done through frequencies, energetically. Some call this vibrational medicine, some call it frequency biofeedback. Whatever you call it, this form of biofeedback is very effective. In development for nearly 20 years, this highly evolved form of biofeedback therapy enables the biofeedback practitioner to open up the body’s meridians and even perform electro-acupuncture to alleviate pain. It enables the user to balance hormones, to perform mild detox, to soothe the system through relaxation frequencies, and clear buried trauma and emotional stresses. There is so much this new quantum biofeedback system can do! Quantum Biofeedback is a Natural Solution for Today’s Health Concerns. Gone are the days when consumers eagerly awaited the next “wonder drug” from the pharmaceutical companies, as a solution to health care. Today’s consumer wants a solution that is natural, clean, long-lasting and without side-effects. Today, 29% of today’s population are termed “Spiritual Sensitives,” according to the best-selling book Megatrends 2010 Their values are not only green-oriented, they are prevention oriented. And for many “Sensitives”, the goal is not just disease-free good health… their goal is Optimal Health. These consumers are willing to take out their debit cards and pay for their own specialized form of health care. Today, 78% of the population is looking for more spiritual answers. That means that in addition to the physical solution, today’s progressives want balance between the physical, mental, emotional and spiritual levels. These values are all integrated within the new field of Biofeedback… more specifically Quantum Biofeedback. Quantum Biofeedback is Such a New Field That It Is Still Easy to Break Into… and There’s Already a Big Demand For It! Who am I and why did I choose Quantum Biofeedback? Allan Schulte, Executive Director of Lotus Stress Relief Center, LLC in Sarasota, Florida. We are one of the leaders in the field of quantum biofeedbacknergetic in the United States and globally. Seeing the need for cutting edge applications of this quantum form of biofeedback. Mr. Schulte founded Lotus Stress Relief in 2008. 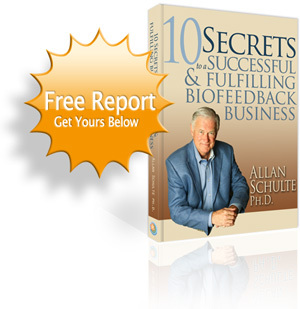 He studied and gained his certification in the field of bioresonance and biofeedback. He trained in San Diego, at New Hope University, and did additional training in Mexico, Germany and Hungary. He is a graduate of the University of Notre Dame in South Bend, Indiana where he earned a degree in Communications. Mr. Schulte studied business at the Northeastern Small Business Institute in Boston. He holds a PhD in Psychology with an emphasis on energetic medicine and stress relief. Biofeedback is a learning process in which people are taught to improve their health and performance by observing signals generated by their own bodies. ”Biofeedback” is a treatment technique in which people are trained to improve their health by using signals from their own bodies,” according to an article by Bette Runck of the National Institute of Mental Health. Biofeedback treatment has been proven to alleviate pain and stress, but most patients benefit from biofeedback by learning to relax and modify their behavior. It is believed that relaxation is a key component in biofeedback treatment of many disorders, particularly those brought on or made worse by stress. What is the L.I.F.E. Biofeedback System? The L.I.F.E. System is a professional biofeedback technology used by thousands of trained and qualified practitioners. Acupuncturists, Chiropractors, Dentists, Homeopaths, Medical Doctors, Nutritionists and Veterinarians are using the L.I.F.E. System to assist in achieving Stress Reduction, Muscle Relaxation, and Preventative Healthcare, while supporting the well being of their patients/clients. The L.I.F.E. System is designed to aide in the reduction of stress and to enhance muscle relaxation. The quantum biofeedback software program communicates information to the client with a comfortable harness that regulates stress responses gently and safely. The L.I.F.E. system is the only device of its kind that has achieved this certification of assurance, providing the confidence that it will function as intended. European Quality Management and Declaration of Conformity certificates are held on file with BIREGS GmbH, Germany. How do Lotus and The LIFE System work together? LOTUS Stress Relief Center uses a combination of biofeedback, bioresonance, neurotherapy and neurofeedback for stress reduction and stress management. We help people manage stress with these relaxing therapies and through our stress relief coaching while using the LIFE biofeedback System. Our mission at LOTUS Stress Relief is to help people heal physically, emotionally, and spiritually by reducing the stress in their lives. LOTUS Stress Relief was founded on the premise that we are all coping with multiple stresses in our complex modern world: health concerns, financial worries, work pressures, job loss or downsizing, family worries, relationship problems, environmental toxins, emotional stress, or fear of the future. Doctors confirm that over 82% of their office visits are due to stress-related issues.As we all know, continual stress can lead to very serious health issues. Biofeedback therapy with the LIFE System is quiet, non-invasive, reassuring and deeply helpful to your tired body and mind. Live, Interactive, online demonstrations of the LIFE system are offered twice a week at Lotus and we are more than happy to tailor a demo just for you. If you are interested in becoming a biofeedback practitioner please enter your name and email address below and we will contact you to arrange time for us to show you this wonderful biofeedback program. You can reach us online at www.lifesystemsales.com or contact us by phone at 941-706-2778 or toll-free at 1-888-830-3222. Copyright © 2019 Biofeedback Machine by LIFE Systems. All Rights Reserved.